Ronit Baranga // Sculptures that speak! 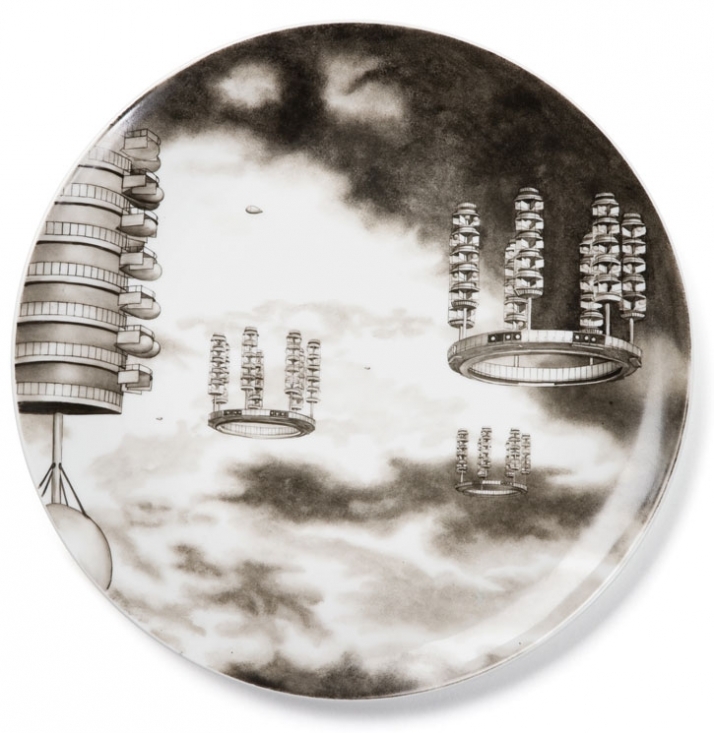 Belgian artist Carsten Höller has devised a very special edition for Porzellan Manufaktur Nymphenburg, called the Flying City Tableware, and we at Yatzer are quite illusioned. 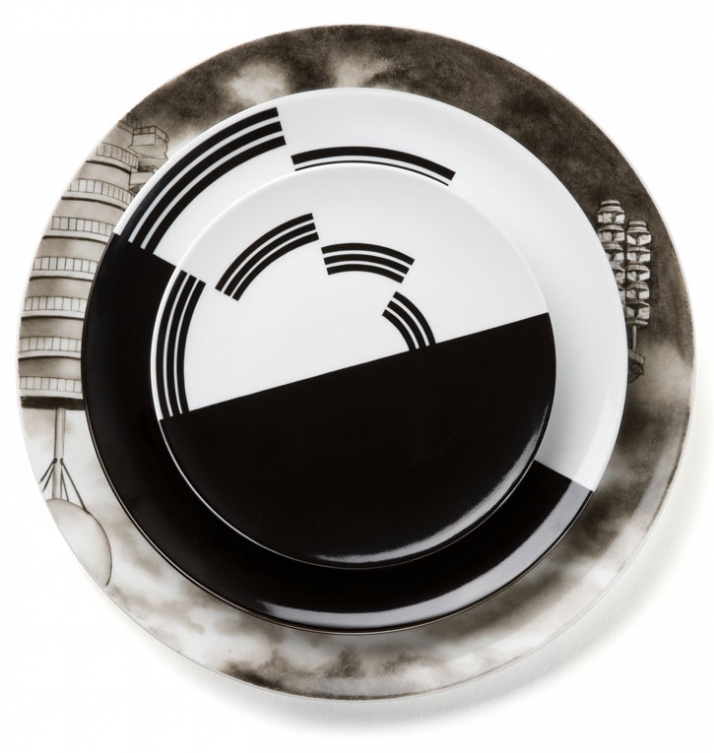 The tableware comprises a combination of a service plate, a dinner plate, a side plate, and a teacup and saucer, each decorated with a design relating to two fundamentally different sources: on the one hand, Georgy Krutikov's (Russian constructivist architect and artist) design for a Flying City (1928). On the other hand, the rotating Benham top or disc (1894-95), eponymously named after its inventor, Charles Benham, that when is spun, arcs of pale colors are visible at different places on the disk causing an impressive optical illusion. 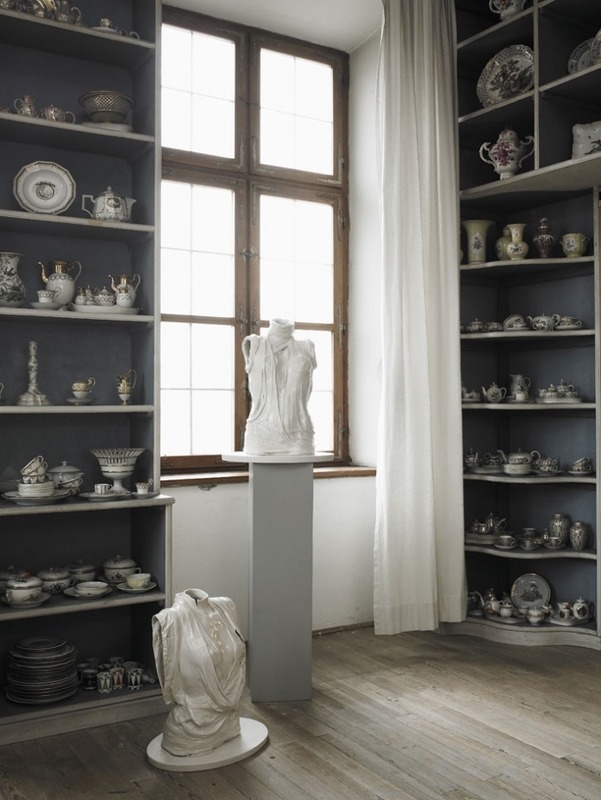 Höller chose Wolfgang von Wersin's LOTOS Service (1932) upon which to present the motif - tableware that belongs to the classical Nymphenburg services of the New Sobriety and reflects, in its elegant simplicity, the functional aesthetics of the avant-garde period. Let’s take a deeper look at Höller’s influences: a radical redesigning of the world was at the heart of the avant-garde movements during the 1910s and 1920s; in 1928, as part of his diploma, the Russian architect Georgy Tikhonovich Krutikov (1899-1958) sketched his utopian, future vision of life in the Flying City which would fly across the skies. His concept comprised residential tower blocks linked to production sites, hotels, factories, etc. Residents could access these sites by means of flying capsules that docked directly in the living spaces and would live and work in the Flying City, whereas the earth was to be primarily reserved for recreation. 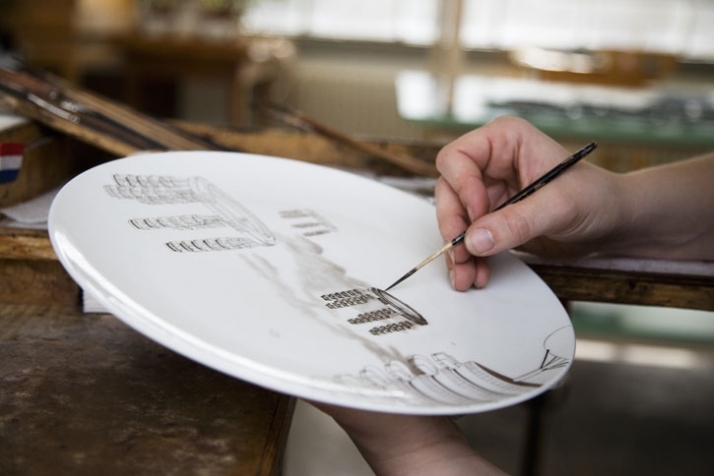 Höller, for his part, has developed the designs for both the service plate and the inside of the teacup, based on Krutikov’s pencil drawings. 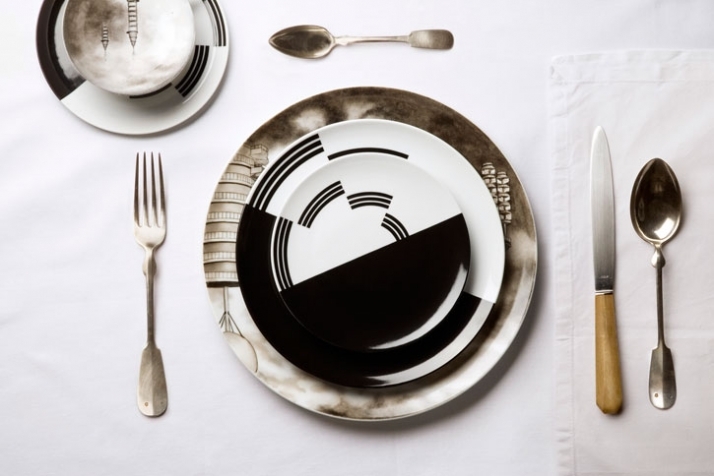 At ï¬rst glance, the abstract monochrome pattern of the dinner plate, the side plate and the saucer may well be reminiscent of graphic designs from the Russian avant-garde. However, it is in fact derived from the rotating discs invented by the British toy manufacturer Charles Benham (1860-1929) towards the end of the nineteenth century. One half of the surface of the disc is painted black whereas the other bears an arrangement of three parallel, black bars that are stepped inwards at a distance of forty ï¬ve degrees. When the disc is rotated at sufï¬cient speed, it is possible to see shades of color in place of the black and white pattern. The seen colors, however, vary from person to person—a phenomenon described by cognitive psychology that remains unexplained to this day. Höller presents the plates with a Benhamesque pattern, as if they had come from the Flying City. When the Flying City Tableware is used, Krutikow’s design is extended to encompass the earth—through our minds and our stomachs. 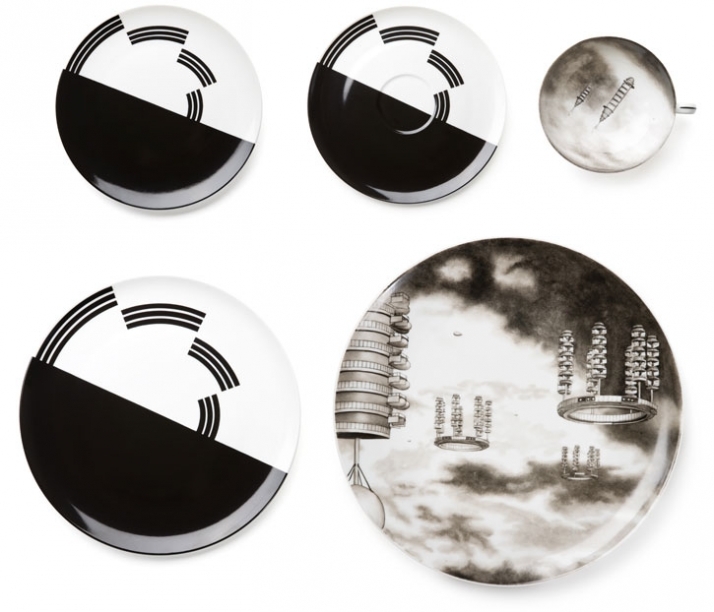 The Flying City Tableware is produced in two different versions. 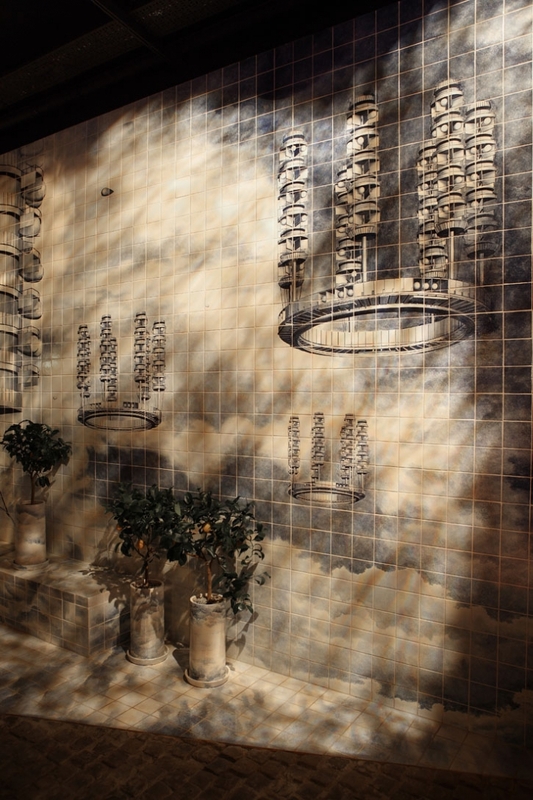 The wall installation - a unique specimen that Höller will be presenting until 25 April 2010 in Rotterdam - comprises eight hand-painted plates, each mounted on a rotating mechanism and connected to one another by a leather transmission belt. The plates can be rotated at a maximum of 600 revolutions per minute, by means of a manual crank. From about 300 revolutions, the effect discovered by Benham, whereby the black and white graphic design is perceived in color, starts to emerge. 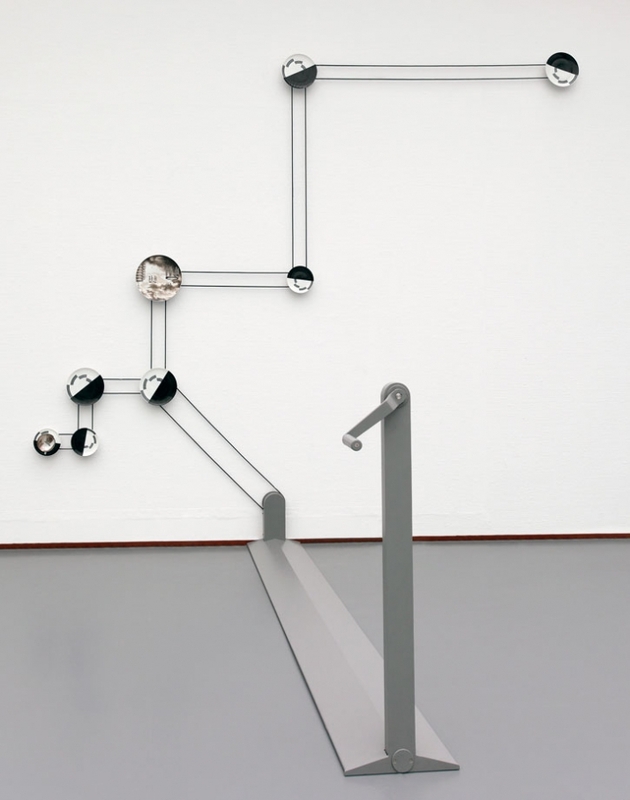 In the installation, the dynamisation inherent in the motifs is achieved through actual mechanical motion. 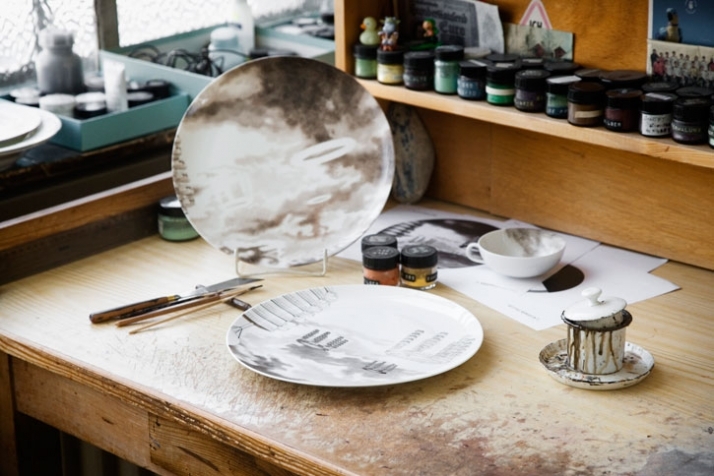 At the same time, the tableware is intended for use: service plate, dinner plate, side plate, and teacup and saucer are also available in a limited edition of twenty five signed services, each designed for two people. A table centrifuge for the rotation of the Benhamesque plates also forms part of this edition. 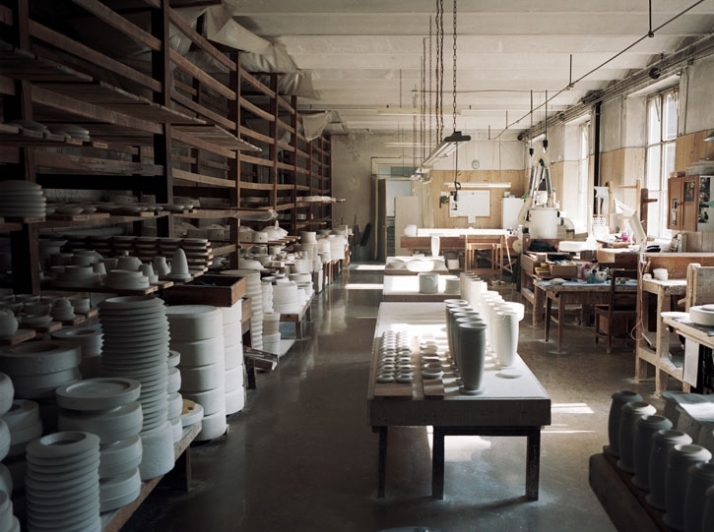 Carsten Höller’s Flying City Tableware for the Porzellan Manufaktur Nymphenburg is both a continuation as well as a premiere. It follows directly on from past collaborations with the most prominent industrial designers such as Konstantin Grcic, Hella Jongerius, and Clemens Weisshaar and Reed Kram; but also the COMMEDIA DELL’ARTE–COUTURE EDITION (2008), to which sixteen leading international couturiers, including Vivienne Westwood, Christian Lacroix, and Gareth Pugh, were invited to design a new “costume” for each of Franz Anton Bustelli’s COMMEDIA DELL’ARTE figurines (1759-60). . Carsten Höller is the first contemporary fine artist to participate in this new series of editions that will continue in the near future, with artists such as Tobias Rehberger, winner of the Golden Lion at the 2009 Venice Biennale, and Joep van Lieshout. Yatzer promises to keep an eye on these very promising collaborations and to keep on flying till then with our readers to the cities of our imagination.